Highlights of this 2019 Ford Explorer XLT include: Third Row Seat, Back-Up Camera, Satellite Radio, Rear Air, ENGINE: 3.5L TI-VCT V6 (FFV), EQUIPMENT GROUP 200A, TRANSMISSION: 6-SPEED SELECTSHIFT AUT. 4x4, Aluminum Wheels, MAGNETIC METALLIC. ENGINE: 3.5L TI-VCT V6 (FFV) Flexible Fuel Vehicle (FFV) system is standard equipment for vehicles w/the 3.5L Ti-VCT V6 engine shipped to Federal Emissions States or Cross Border State dealers and is only available w/a Federal emissions system, (FFV system not available w/code 422 and requires code 936 or 423 if applicable for California Emissions State dealer destinations).Cross border states include AZ, DC, ID, NH, NV, OH, VA, WV (STD), TRANSMISSION: 6-SPEED SELECTSHIFT AUTOMATIC (STD). Edmunds.com's review says Well-tuned electric steering system and natural assist level; it turns in with immediacy. Good heft at speed but light enough for parking-lot duty.. Highlights of this 2019 Ford Explorer XLT include: 3rd Row Seat, Back-Up Camera, Satellite Radio, Rear Air, ENGINE: 3.5L TI-VCT V6 (FFV), EQUIPMENT GROUP 200A, TRANSMISSION: 6-SPEED SELECTSHIFT AUT. 4x4, Alloy Wheels, AGATE BLACK METALLIC. Well-tuned electric steering system and natural assist level; it turns in with immediacy. Good heft at speed but light enough for parking-lot duty. -Edmunds.com. Highlights of this 2019 Ford Explorer XLT include: 3rd Row Seat, Flex Fuel, Alloy Wheels, 4x4, Back-Up Camera, Rear Air. Highlights of this 2019 Ford Explorer XLT include: 3rd Row Seat, Rear Air, Back-Up Camera, Satellite Radio, TRANSMISSION: 6-SPEED SELECTSHIFT AUT. FRONT & SECOND ROW FLOOR LINERS, EQUIPMENT GROUP 200A, ENGINE: 3.5L TI-VCT V6 (FFV), 4x4, Alloy Wheels, INGOT SILVER METALLIC. FRONT & SECOND ROW FLOOR LINERS, ENGINE: 3.5L TI-VCT V6 (FFV) Flexible Fuel Vehicle (FFV) system is standard equipment for vehicles w/the 3.5L Ti-VCT V6 engine shipped to Federal Emissions States or Cross Border State dealers and is only available w/a Federal emissions system, (FFV system not available w/code 422 and requires code 936 or 423 if applicable for California Emissions State dealer destinations).Cross border states include AZ, DC, ID, NH, NV, OH, VA, WV (STD), TRANSMISSION: 6-SPEED SELECTSHIFT AUTOMATIC (STD). Highlights of this 2019 Ford Explorer XLT include: Third Row Seat, Back-Up Camera, Satellite Radio, Rear Air, ENGINE: 3.5L TI-VCT V6 (FFV), EQUIPMENT GROUP 200A, TRANSMISSION: 6-SPEED SELECTSHIFT AUT. 4x4, Aluminum Wheels, BURGUNDY VELVET METALLIC TINTED CLEAR. Highlights of this 2019 Ford Explorer XLT include: Third Row Seat, Rear Air, Back-Up Camera, Satellite Radio, 4x4, CLASS III TRAILER TOW PACKAGE, EQUIPMENT GROUP 200A, TRANSMISSION: 6-SPEED SELECTSHIFT AUT. ENGINE: 3.5L TI-VCT V6 (FFV), Aluminum Wheels, Trailer Hitch, AGATE BLACK METALLIC. Highlights of this 2019 Ford Explorer XLT include: Third Row Seat, Rear Air, Back-Up Camera, Satellite Radio, 4x4, CLASS III TRAILER TOW PACKAGE, EQUIPMENT GROUP 200A, TRANSMISSION: 6-SPEED SELECTSHIFT AUT. ENGINE: 3.5L TI-VCT V6 (FFV), Aluminum Wheels, Trailer Hitch, BLUE METALLIC. Edmunds.com explains Well-tuned electric steering system and natural assist level; it turns in with immediacy. Good heft at speed but light enough for parking-lot duty.. Highlights of this 2019 Ford Explorer XLT include: Third Row Seat, Back-Up Camera, Satellite Radio, Rear Air, ENGINE: 3.5L TI-VCT V6 (FFV), EQUIPMENT GROUP 200A, TRANSMISSION: 6-SPEED SELECTSHIFT AUT. 4x4, Aluminum Wheels, AGATE BLACK METALLIC. Highlights of this 2019 Ford Explorer XLT include: 3rd Row Seat, Rear Air, Back-Up Camera, Satellite Radio, ENGINE: 2.3L I-4 ECOBOOST, EQUIPMENT GROUP 200A, TRANSMISSION: 6-SPEED SELECTSHIFT AUT. OXFORD WHITE, 4x4, Turbo, Alloy Wheels. OXFORD WHITE, TRANSMISSION: 6-SPEED SELECTSHIFT AUTOMATIC (446). Highlights of this 2019 Ford Explorer XLT include: Third Row Seat, Rear Air, Back-Up Camera, Satellite Radio, 4x4, CLASS III TRAILER TOW PACKAGE, EQUIPMENT GROUP 200A, TRANSMISSION: 6-SPEED SELECTSHIFT AUT. ENGINE: 3.5L TI-VCT V6 (FFV), Aluminum Wheels, Trailer Hitch, INGOT SILVER METALLIC. Highlights of this 2019 Ford Explorer XLT include: 3rd Row Seat, Rear Air, Satellite Radio, Back-Up Camera, 4x4, TRANSMISSION: 6-SPEED SELECTSHIFT AUT. FRONT & SECOND ROW FLOOR LINERS, EQUIPMENT GROUP 200A, BLUE METALLIC, Alloy Wheels, ENGINE: 3.5L TI-VCT V6 (FFV). Highlights of this 2018 Ford Explorer XLT include: Sunroof, Navigation, Heated Seats, 3rd Row Seat, Rear Air, 4x4, Alloy Wheels, EQUIPMENT GROUP 201A, Onboard Communications System, Back-Up Camera, EBONY BLACK, UNIQUE CLOTH BUCKET SEAT. ENGINE: 3.5L TI-VCT V6 (FFV), Trailer Hitch. Highlights of this 2019 Ford Explorer XLT include: Third Row Seat, Flex Fuel Capability, Aluminum Wheels, Four Wheel Drive, Back-Up Camera, Rear A/C. Highlights of this 2019 Ford Explorer XLT include: Third Row Seat, Flex Fuel, 4x4, Aluminum Wheels, Back-Up Camera, Rear Air. Highlights of this 2018 Ford Explorer XLT include: 3rd Row Seat, Sunroof, Turbo, 4x4, Onboard Communications System, Back-Up Camera, Rear Air, TRANSMISSION: 6-SPEED SELECTSHIFT AUT. FORD SAFE & SMART PACKAGE, EQUIPMENT GROUP 202A, TWIN PANEL MOONROOF, ENGINE: 2.3L I-4 ECOBOOST. Highlights of this 2018 Ford Explorer XLT include: 3rd Row Seat, NAV, Sunroof, Heated Leather Seats, Quad Seats, FRONT & SECOND ROW FLOOR LINERS, 4x4, Back-Up Camera, Rear Air, XLT TECHNOLOGY FEATURE BUNDLE, ENGINE: 3.5L TI-VCT V6 (FFV), WHEELS: 20 POLISHED ALUMINUM, TWIN PANEL MOONROOF, TRANSMISSION: 6-SPEED SELECTSHIFT AUT. Highlights of this 2018 Ford Explorer XLT include: Nav System, Heated Leather Seats, Third Row Seat, Moonroof, WHEELS: 20 POLISHED ALUMINUM, Onboard Communications System, Back-Up Camera, TRANSMISSION: 6-SPEED SELECTSHIFT AUT. FRONT & SECOND ROW FLOOR LINERS, EQUIPMENT GROUP 202A, TWIN PANEL MOONROOF, Rear Air, 4x4. 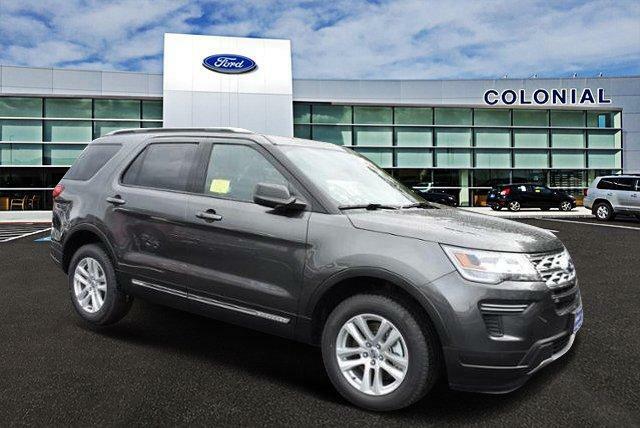 Highlights of this 2019 Ford Explorer XLT include: Nav System, Third Row Seat, Hitch, Back-Up Camera, 4x4, Rear Air, CLASS III TRAILER TOW PACKAGE, TRANSMISSION: 6-SPEED SELECTSHIFT AUT. EQUIPMENT GROUP 202A, WHEELS: 20 POLISHED ALUMINUM, RUBY RED METALLIC TINTED CLEARCOAT, ENGINE: 3.5L TI-VCT V6 (FFV). Highlights of this 2019 Ford Explorer XLT include: Third Row Seat, Nav System, Moonroof, Heated Seats, Aluminum Wheels, Hitch, 4x4, Back-Up Camera, Rear Air, XLT TECHNOLOGY FEATURE BUNDLE, COLD WEATHER PACKAGE, FORD SAFE & SMART PACKAGE, TRANSMISSION: 6-SPEED SELECTSHIFT AUT.